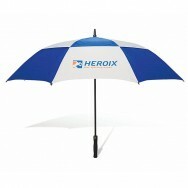 Printed Golf Umbrellas are a great method of promoting your company. The big printing area gives these items a huge advantage to other branding items. Promotional golfing umbrellas will also be used off the course, opening up your brand to even more exposure and promoting your brand to the public. 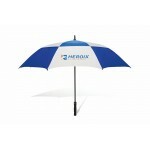 Promotional Auto-Opening Vent Golf Umbrella has a double canopy to allow ventilation. This Printed G..